recommended specifications.Tires should be equal in size and type. Runout must not be excessive. Tires and wheels should be in balance. linkage and suspension must not have excessive wear and/or looseness. Check for wear in tie rod ends and ball joints. load and spare tire in vehicle. No extra load should be on vehicle. to settle to normal ride height. adjusting sleeve and lengthening opposite sleeve equal amounts. 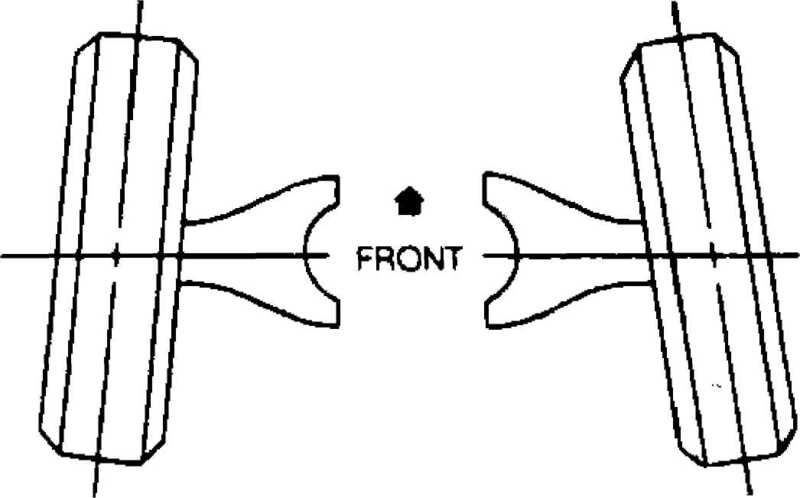 Camber is the inward or outward tilt of the wheel as viewed from front of vehicle. Camber is measured from centerline of vehicle. When wheel is tilted outward at top from centerline of vehicle, camber is positive. 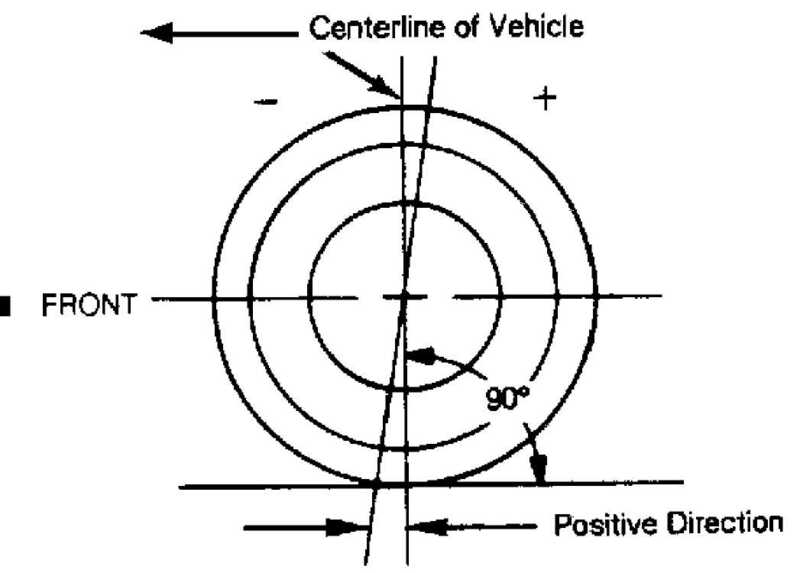 When wheel is tilted inward at top from centerline of vehicle, camber is negative. Camber is measured in degrees from vertical. or backward tilt from vertical is viewed from side of vehicle. 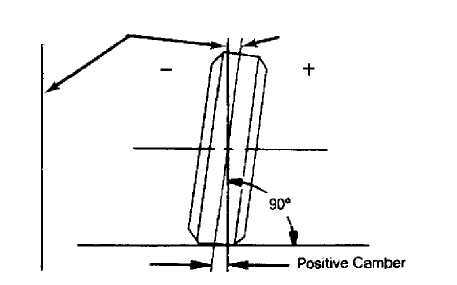 When axis is tilted backward from vertical, caster is said to be positive, creating a trailing action on front wheels. 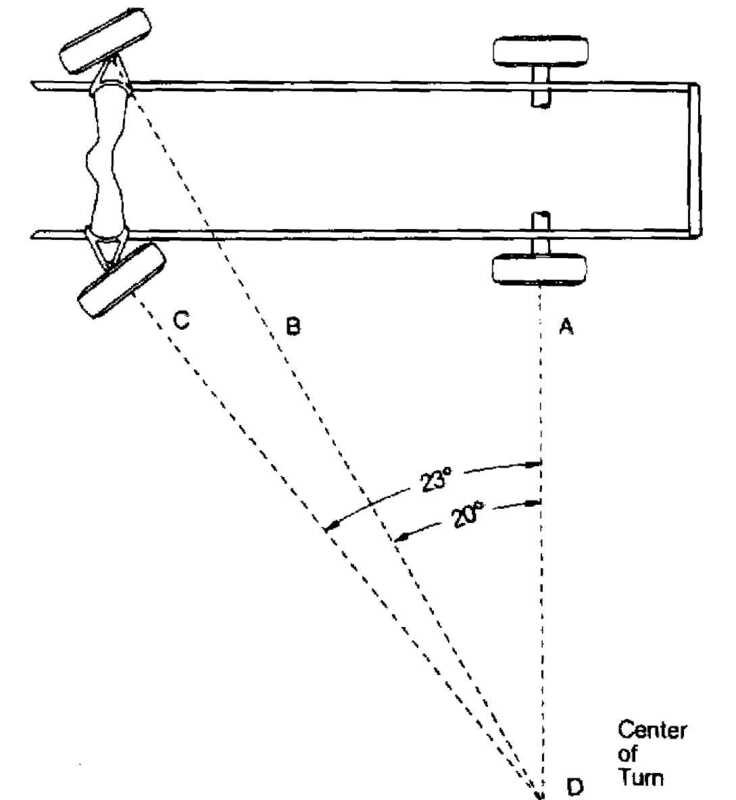 When axis is tilted forward, caster is negative, causing a leading action on front wheels. 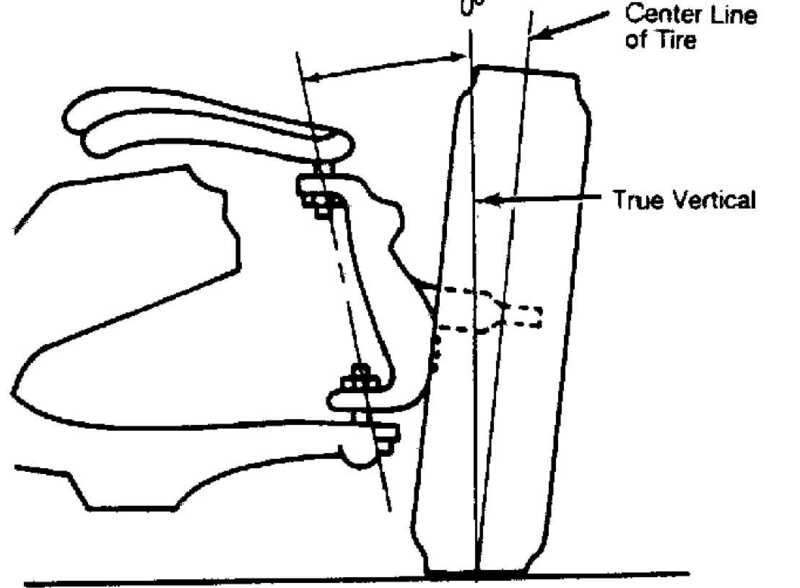 Toe is the measured difference in inches of distance between the front edge of the tires and the rear edge of the tires at spindle height. Toe can be measured in inches or degrees. and compensate adjustment more to that side to center steering wheel. A couple of tries will probably be necessary to properly center steering wheel. 3) When tightening clamps, make sure that clamp bolts are positioned so there will be no interference with other parts throughout entire travel of steering linkage. To adjust, turn sleeves an equal amount in opposite directions. check toe-out with weight of vehicle on wheels. wheel. Repeat test for right wheel. not attempt to correct by straightening parts. service adjustment. Vehicle must be level, both crosswise and lengthwise. Camber should be properly adjusted. same amount, upper and lower control arms are bent. adjustments. Do not attempt to correct by straightening parts. NS - Information not available from manufacturer. Inflate tires to proper air pressure. Specifications can be found on door pillar or in glove box. Cargo compartment must by empty. Fuel tank should be full. Bounce vehicle up and down to normalize ride height. Ride height specifications in regard to setting camber and caster are not provided by the manufacturer.